Pakistan’s Best Bank 2016; inaugurated its first ‘Branch of the Future’in Karachi on 21 May 2017. Consistent with the bank’s progressive and innovative brand attributes, this spacious facility is uniquely futuristic in its offering, providing customers with state-of-the-art facilities enclosed within a cutting-edge modern design. 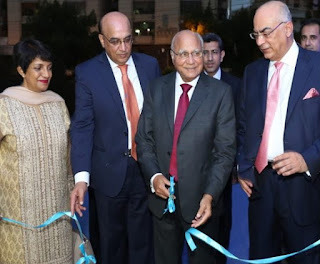 The branch was inaugurated by Sir Mohammed Anwar Pervez, OBE HPk, Chairman Board of Directors UBL and Bestway Group UK. Also present at the event were Zameer Mohammed Choudrey, CBE FCA, Director UBL, Wajahat Husain, President & CEO UBL, Sima Kamil, Deputy CEO UBL and senior executives of the Bank.